I'll preface this by confessing that I am borderline phobic about flying. I avoid it whenever I can, and I enjoy a pharmaceutical assist whenever I can't. So maybe I'm actually phobic, shut up, whatever. I make up for it by being generally awesome otherwise. Two years ago I had a work conference at Disney World. The three of us flew down. In addition to my normal stress I was hoping and praying that Anna would enjoy herself and not be a pest to other travelers. The last thing I wanted was for her to pick up on my own anxiety; I could have won an Academy Award that day. So I packed a laptop full of movies, any and all non-contraband snacks, a pacifier (she was three but cabin pressure something something), I'd filled my phone with kid apps and left my husband to manage the logistics of our duffel bag, carry-on, seven-million pound car seat, tipping the skycap, and remembering where I'd parked the car. If you haven't been on a flight to Orlando, Florida, then you don't know what it is to wait at your gate behind several strollers, wheelchairs, children and high school kids going on a summer field trip. It's just about three hours from where we are to Orlando, and other than rapid-fire requests for snacks, more movies, more volume, and her refusal to let me open the window shade, Anna did amazingly well on her first flight. I did pretty well too, on this my twentieth-or-so flight, as did the woman flying alone with five kids across the aisle. Can I tell you who didn't do so great? It was the class trip. As I sat wearing my best Turbulence is Awesome face, pointing out familiar land masses miles below us, and laughing myself onto a no-fly list reading Bossypants, most of the high school kids made dramatic "WHOOOOOOAAAAAA" sounds with each bump. There were loud "OMIGOD"s and then someone asked if they were going to die. I felt bad for those kids, because they couldn't even order in-flight cocktails. I felt bad for those kids the same way I sympathize with parents who are equally unsure of how their flight will go, because "Will my toddler spend 3 hours kicking the seat?" is the parent equivalent of a teenager wondering how often planes spontaneously nosedive. 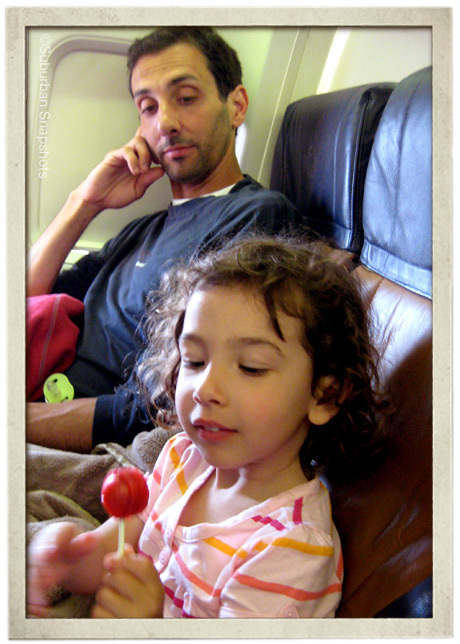 There's endless advice on flying with kids, ideas for how to make the trip less stressful for both parents and offspring, because there's a huge difference between remembering your passport, enough underwear, and shoes you can easily slip off at security and having to carry on the accouterments that keep the preschool set occupied for hours, on top of the worry that the mere sight of your child will result in audible sighs from 150 strangers. So I implore my happily no-kid friends, the next time you board a flight to your no-kid destination, don't take to Facebook before taxi to post about your preemptive annoyance over the potential fussiness of the baby next to you. Consider that while you breezed through the terminal Starbucks, your row-mate had to traverse the airport like a sherpa whose client wouldn't stop sprinting toward peril. Try to imagine what it might be like to have to control someone else's bladder mid-flight. We are all using a very public mode of transportation, one that's not especially accommodating to us breeders. Know that we are stressed, uncomfortable, and hoping like hell our kids don't behave like marsupials. And remember mostly that we were all kids once, and as adults we could stand to do a little less whining.